Why Buy a Burr Grinder? Unlike your typical blade grinder where the coarseness of the grind depends on how long you grind your coffee beans, a burr grinder allows you to choose the desired coarseness. This moves the internal walls of the grinder apart and your beans are crushed according to how fine you want them. This results in a more uniform grind instead of the mix of fine and coarse coffee grounds when you use a blade grinder. When it comes to the price of Burr Grinders, the price can vary greatly. You could get a grinder for below $50 and at the same time there are many that cost upwards of $300. So what gives? Many coffee aficionados will tell you to avoid electric burr grinders below $50. The sub-$50 coffee grinders were infamous for their poor build quality and the ensuing frustration. For the most part, you get what you pay for. Cheap coffee grinders aren't going to make the cut for the experienced barista, the coffee enthusiast or the coffee geek. That said, any of these grinders would be a good fit for someone just starting to experiment with brewing their own coffee and don't want to invest in a commercial-grade burr coffee bean grinder. As mentioned earlier, electric burr grinders are a step up from manual grinders and electric blade grinders. You'll get a consistency that's good enough for any brewing method and the best part is that they're relatively inexpensive. 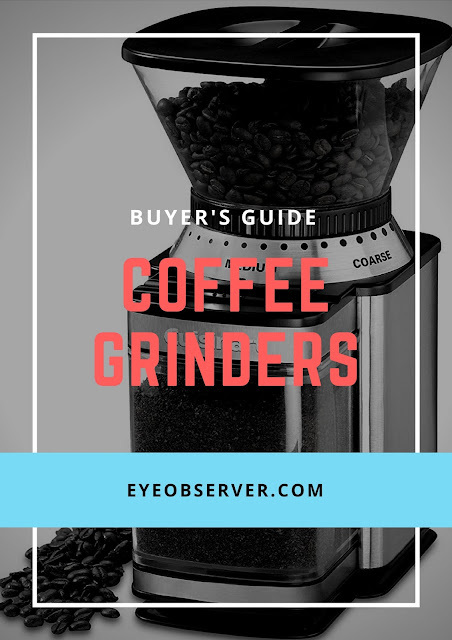 The most important thing to consider when choosing these entry-level coffee bean burr grinders is the consistency of the grind and the durability of the machine. 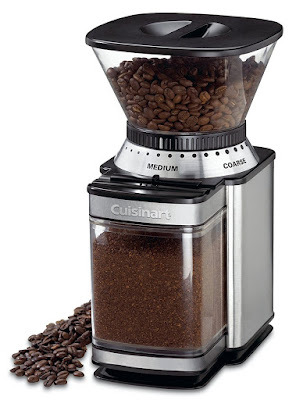 When it comes to affordable grinders and coffee machines, Cuisinart is a brand that should be at the top of your mind. The Cuisinart DBM-8 Supreme Grind Automatic Burr Mill (what a mouthful) lives up to Cusinart's reputation and is easy to use and durable. Probably the budget grinder we'd recommend checking out the first. If you're fussy about your coffee, you'd probably want to start looking elsewhere. While the DBM-8 is able to get the grind right for the French Press, it does leave a little to be desired when it comes to espressos and pour-overs. The DBM-8 Supreme can store 8 oz of beans in it's hopper and has 18 grind settings. It's pretty self-explanatory to use - nothing overly complicated. Even newbies can figure it out by themselves. As mentioned above, the DBM-8 Supreme's conical burr grinder works best for automatic drip-brew and French press methods. Compared to a commercial-grade burr grinder, it isn't as accurate, but it's also retailing for about a quarter of the price. In fact, it's only slightly more expensive than a blade grinder. For around the same price, you could also get a manual grinder that would give you a consistent grind. Manual grinders require a lot of effort though and if you're thinking of grinding coffee beans for more than 4 cups of coffee at a time, you're in for a workout! Save yourself the effort with the DBM-8 Supreme, which can grind you 18 cups of coffee worth of beans at one time. So if the grind consistency of the DBM-8 Supreme isn't that fantastic, why do we have it at the top of our list? For two simple reasons, really. It's very durable and super easy to use. Simply choose the number of cups you wish to grind for, the grind size and press the start button. It's really that simple! And if you clean your grinder regularly, this grinder's going to be in your kitchen for years to come. The KRUPS GX5000 is another affordable and basic coffee burr grinder like the DBM-8 Supreme. Modern and sleek, it has 9 different grind settings to choose from. Grind your coffee beans from fine (espresso) to coarse (french press) for every type of coffee beverage. The hopper allows you to store up to twelve cups of coffee worth of beans at a time. The KRUPS GX5000's burr mechanism is solid and sturdy, made of stainless steel. One of the big plus points about this coffee grinder is that it doesn't overheat. The KRUPS GX5000 Burr Grinder also has a coffee container with a lid that helps to preserve the flavor and freshness of your ground coffee. The lid is anti-static, so you don't have the typical problem of the grounds clinging on to the surface of the lid. So those are the positives of the GX5000 but what are the drawbacks? Like most sub-$50 coffee bean grinders, the consistency of the grind is an issue. 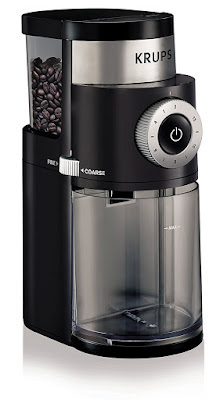 Again, if you're just starting to experiment with homebrewing your coffee, this would be a good entry-level grinder. If you're more experienced, i'd advise you to stay away from this one. The grounds tend to come out a little too fine regardless of the setting you choose. The Bodum Bistro Electric Burr Coffee Grinder is another great entry-level grinder for the homebrewer who is just getting started. The highlight of this beauty is that it is specifically designed to deal with the problem of static, which results in sticky coffee grounds that clog your coffee grinder. This is a particular problem if you're a fan of dark roasts or oily coffee beans. 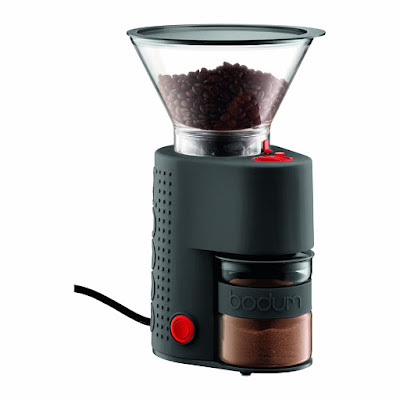 The Bodum Bistro features 14 grind settings and it is pretty consistent for the price. One complaint we have is that there isn't a "cup" setting that allows the user to choose the number of cups of coffee they want the beans ground for. Most coffee grinders use plastic containers to receive the ground coffee but this results in the coffee powder getting statically charged and spilling all over the place. The Bodum Bistro comes with a borosilicate glass container to catch the grounds instead. Borosilicate glass is inherently static-free, reducing the amount of static and prevents your coffee grounds from "jumping". Sleek and modern looking, we also like the fact that the Bodum Bistro is one of the few coffee grinders to come in such a wide variety of colors. Available in black, orange, red, green, white and even copper! So we like the Bodum Bistro's anti-static glass catcher, the consistency of the grind as well as the design and color options. Surely this must be the perfect coffee bean grinder then? Well, unfortunately there are some drawbacks that we need to highlight. Probably the most critical is the plastic gears between the motor and burr. This impacts the durability of the grinder and some users have experienced the gears breaking on them after a year or so, resulting in the grinder being unusable. Bodum doesn't sell replacement gears, so once they're broken, you will need to get a new grinder. The other downside of the Bodum Bistro Electric Burr Coffee Grinder is that it costs about 50% more than either the Cuisinart DBM-8 Supreme and KRUPS GX5000 Burr Grinder. If you're a new home barista, there's no reason to jump into the deep end and purchase a commercial-grade burr grinder. You're better off with any of the entry models and practicing before upgrading. We pick Cusinart's DBM-8 as our top affordable coffee bean grinder - providing the right balance of grind quality, price and durability.